Interests:Prayer Man, South Knoll shooter, & the medical evidence LGBT activism/marriage equality, Minoan archaeology, history, Italy, Greece, travel, foreign languages, foreign film - especially Italian. Here is a photo - a still from the Hughes film - that Denis Morrisette posted. He pointed out the man on the left of the TSBD doorway and wondered if it was a reporter (not sure which reporter he had in mind). But I believe it could be Capt. David Sooy - same grey hat with black band. Same black suit with white shirt collar sticking up. 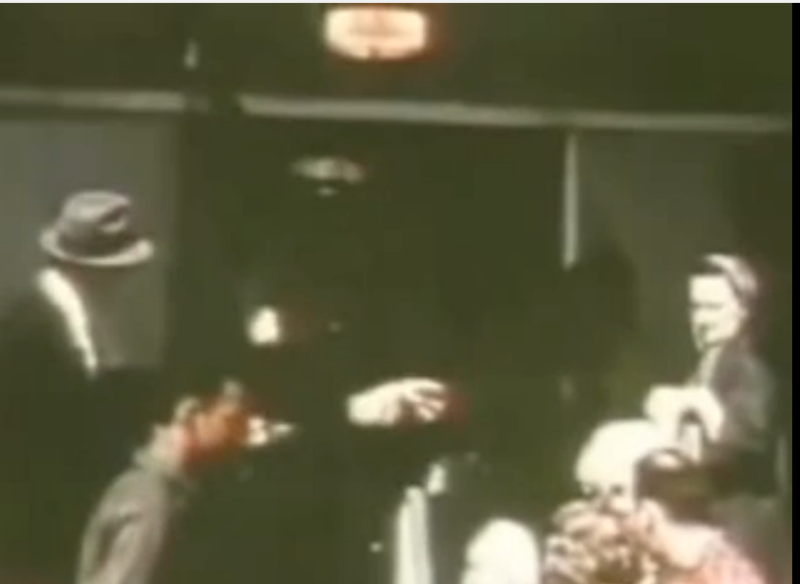 In the DCA Film (posted above) when we first see this gentleman he is directly in front of the TSBD steps - not that many feet in front of them - and appears to be coming straight out from the steps toward the camera and viewers. So, had he been on the steps? Is this him on the steps only seconds or minutes earlier? Had he been in the bldg? He appears to be talking to the DPD officer (Barnett? ), as the Hughes and Martin films show. Is he attempting to enter the bldg? Or talking to him to get - or provide - information about things? In the clearer Martin sequence on the left, at one point, one can see his aged, thin, deeply-lined face as he turns his head to toward the viewer. 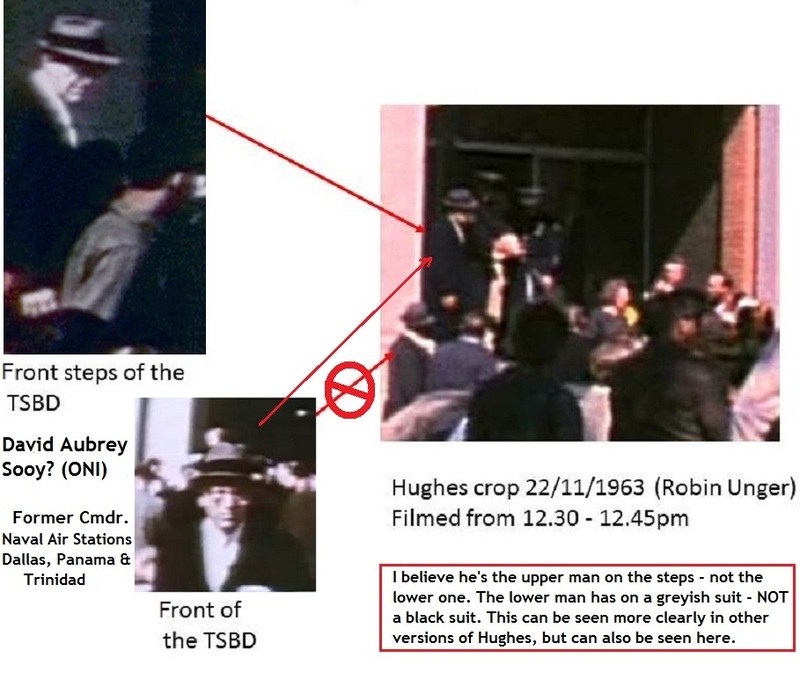 IMO, it is Sooy - the very same man as captured in the DCA Film, seemingly walking away from the steps. Too bad his good friends, Frank Krystinik (ONI) and Michael Paine couldn't join him! Alas, they were sequestered deep inside their Bell Helicopter Laboratory at that very moment....allegedly....listening to live radio reports of the assassination and the Tippit shooting, and brewing up some very thick, steamy B.S. in a beaker somewhere. But, at the same time, keeping their attention focused on the radio reports, until Michael, allegedly, upon hearing about the Tippit shooting, hopped in his car and drove "home" to Ruth's at 3pm (where she was no doubt innocently stirring her own beakers of B.S. in her little house-wifey kitchen)! 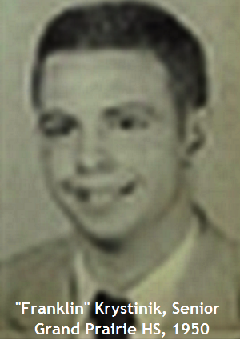 Mr. LIEBELER - Where were you on the morning of November 22, 1963? Mr. PAINE - I was having, at the time of the assassination I was at work, of course, but at the time of the assassination I was in the cafeteria associated with the bowling alley having lunch. Mr. LIEBELER - Who was with you? Mr. PAINE - A student, a co-op student called Dave Noel happened to be with me. We happened to be talking about the character of assassins at that lunch-time, of all things. 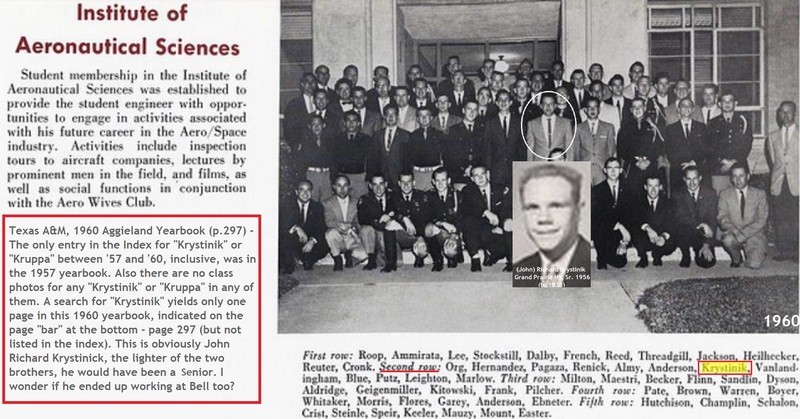 Mr. LIEBELER - Prior to the time you heard of the assassination? Mr. PAINE - That is right. When we first sat down at the meal we were discussing it, beside the point, except unless you believe in extrasensory perception, but we happened to just--we didn't have enough historical knowledge to explore it, but I just raised the question and tried to pursue it, and then dropped it, and then a waitress came and said the President had been shot, and I thought she was cracking a nasty joke, and went over to a cluster of people listening around a transistor set, and heard there was some commotion of this sort from the tone of the voice of the transistor set, and we went back to the lab where there is a good radio, and followed the news from there. And here's a nice photo i found of the traffic Island and stoplight where Truly#1 (NOT Truly) was standing. In it we can see what a small space it is based upon how few people are standing on it, and it's pretty apparent that QM-Man was probably not standing ON the island - but to the left of it (as seen in Altgens6) in the Elm Extension; or on the concrete sidewalk area east of it - possibly even east of the real Truly Group (Truly#2). 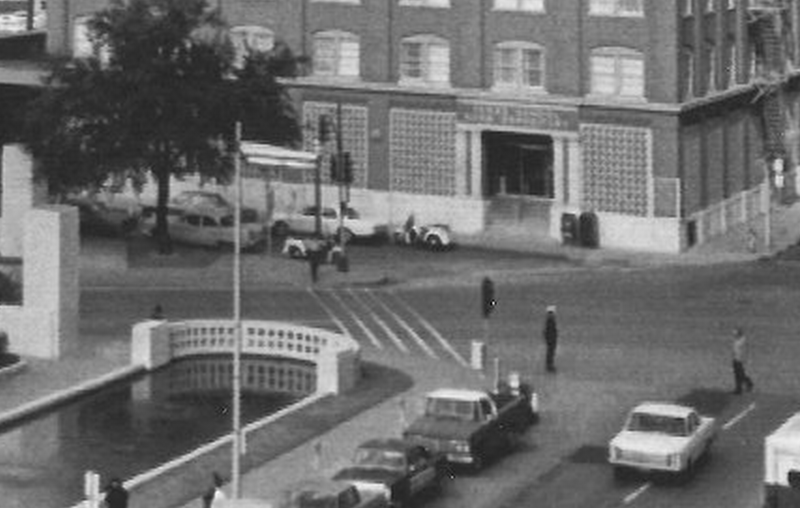 Here's another great view of the front of the TSBD and this odd little intersection. We can see how small it is in actuality, and where he could have parked - either on Houston or the Elm Ext. And it gives us an idea of where the Truly group was and where Sooy could have been north & east of the traffic Island - and beyond the Truly group and the TSBD. doorway. Also It helps show why some of the people explained they were "out in the street" when they were standing in front of the steps - the sidewalk in front of the steps quickly "merges" with the Elm Ext and Elm St.
USN Capt. 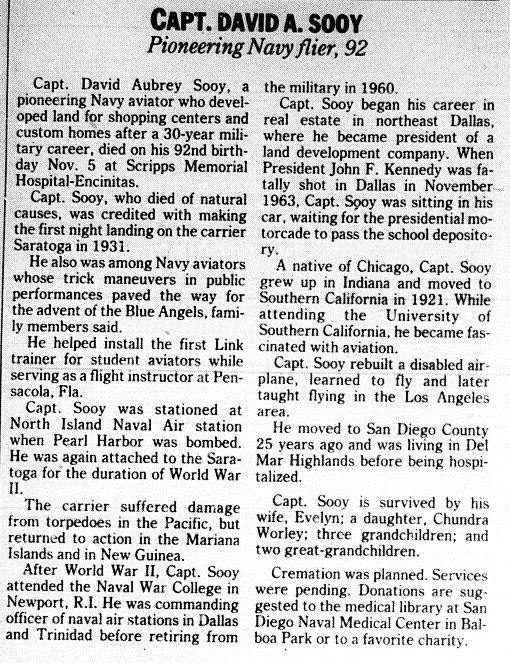 David A. Sooy, served in the Navy in the 1930's and before, and during, WWII in the Pacific. 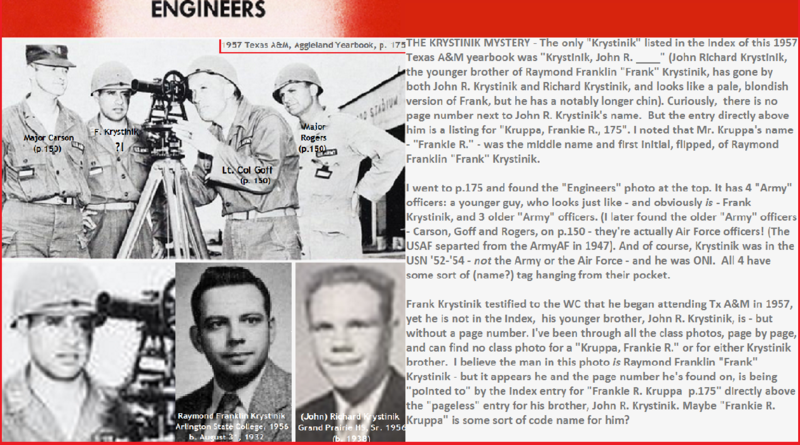 Two researchers, James Richards and Greg Parker have stated he was ONI - as was his good friend Raymond Franklin "Frank" Krystinik - who was officially in the USN '52-'54. Krystinik worked at Bell Helicopter and was good friends with Michael Paine. (Parker is a meticulous JFK researcher who has authored 2 books of a trilogy (the third forthcoming) on Oswald: "Lee Harvey Oswald's Cold War: Why the Kennedy Assassination Should Be Reinvestigated". He also first pointed out Prayerman ~13 yrs ago, whom Sean Murphy picked up about 5 or 6 years ago and so brilliantly fleshed out). Sooy was also the commander of several Naval Air Stations: Dallas, Bilbao Panama, and Chaguaramas, Trinidad (T&T), after which he retired in July 1960 according to his military records. He then moved back to Dallas, divorced his first wife and remarried the Cmdr of the Waves Reserve Training Unit in Dallas in Aug. '1963. 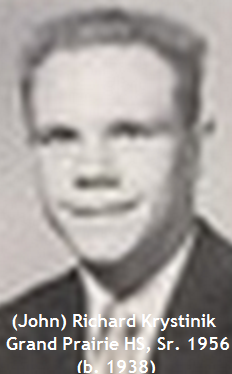 Later they moved back to California where he died in 1995 and is buried at a military cemetery (findagrave memorial). Sooy was born in Chicago in 1903, but the 1910 census, shows him living with his mother and father in Columbus, Indiana (between Indy and Louisville) as a child, where his father, Oliver, was an insurance salesman for the Prudential Ins. Co., and later a minister (there's a joke there somewhere. ). However, while he was still a child, his family moved to Shelbyville (near Indy) and Indianapolis. 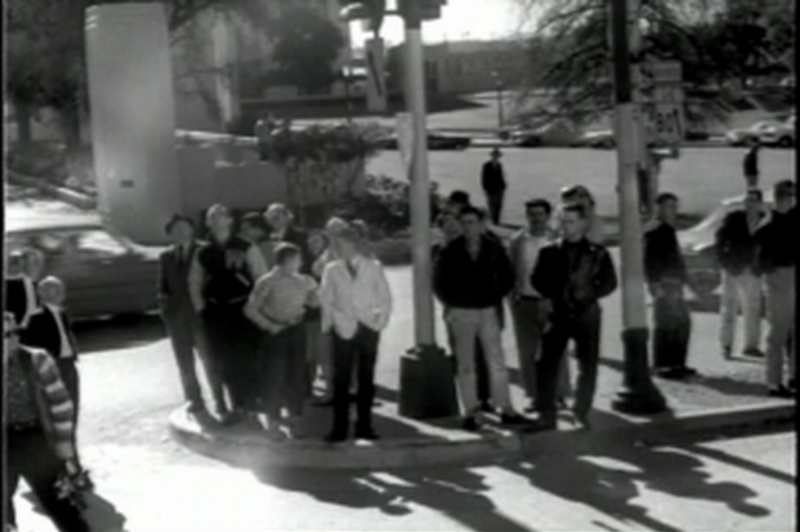 "When President John F.Kennedy was fatally shot in Dallas in November 1963, Capt. Sooy was sitting in his car, waiting for the presidential motorcade to pass the school depository." On July 21, 1954, he became the Cmdr. of the Naval Air Station, Dallas - until 1956 when he was transferred to command the Naval Air Station in Bilboa, Panama for about a year, before being transferred again to command the Naval Base in Chaguaramas, Trinidad W.I. (about 5 mi. from the capital, Port of Spain) in 1957. Apr. 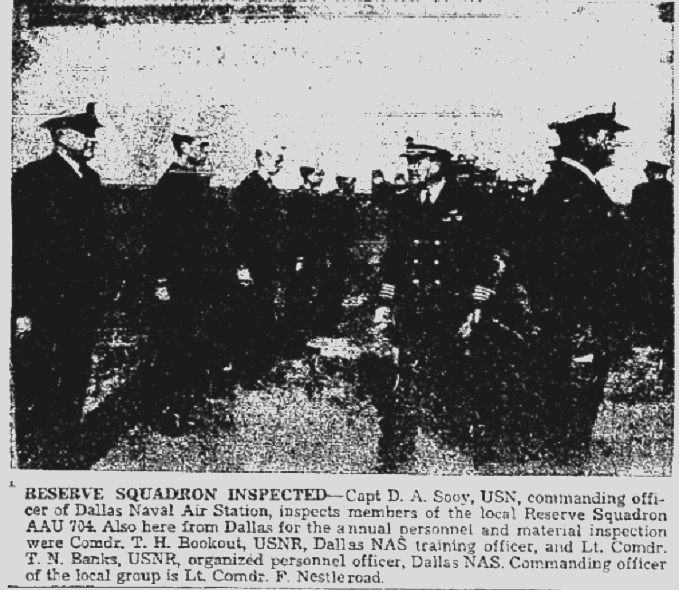 3, 1955 clipping from one of the DFW local papers. "The entire Chaguaramas peninsula was leased to the United States in 1940 for the construction of a naval base under the Destroyers for Bases Agreement. "The base was also used during the early 1960s as a BMEWS (ballistic missile) early warning radar site, as well as serving as a missile tracking site on the U.S. Air Force Eastern Test Range. "The base was scaled back in 1956 and the area was returned to Trinidad and Tobago control in 1963." He retired from the Navy there in July 1960 according to his military records. Capt. David A. Sooy, USN, is to relieve Comdr. Jack A. Francis of command of the Naval Air Station here at a formal ceremony tomorrow morning, The Grand Prairie Texan learned today. Captain Sooy will be the permanent commander, succeeding Capt. Stanley C. Strong, USN, who was detached in June to assume command of the USS Tarawa. During the period since Captain Strong left, Commander Francis has been acting commanding officer. He will assume the duties of executive officer of the NAS when Captain Sooy officially takes command. A native of Chicago, Captain Sooy was born Nov. 5, 1903. He was first commissioned in the U. S. Naval Reserve Sept. 1, 1931, as an ensign. After two stays of inactive duty in the 1930s, Captain Sooy was recalled in 1938 as an instructor at NAS, Pensacola, Fla. In April, 1941, he was aboard the USS Saratoga when the United States entered World War II. 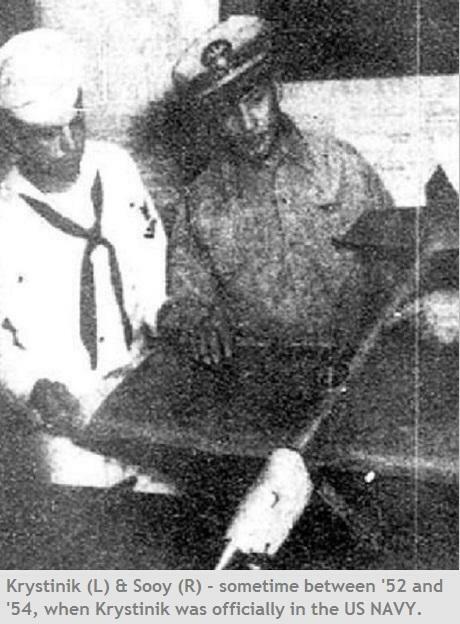 Captain Sooy took part in fighting in the Solomons until he was detached and ordered to NAS, San Diego, Calif. During the last few months of the war, he was executive officer of the USS Kasaan Bay, and took part in anti-submarine operations around the Marshall-Gilbert Islands, the Marianas mid Philippine Sea. He attended the General UNA School [sic - this should read USNWC, the US Naval War College, in Newport RI; not the U(S)NA, US Naval Academy, which is in Annapolis], Newport, R. I. in 1946 and 1947, and later served as officer in charge of Tactical Air Control Squadron Three. January, 1949, he joined the staff of the commander, Amphibious Training Command, U. S Pacific Fleet, with headquarters at Coronado, Calif. He became head of the technical section, Civil Aviation Liaison Branch, office of the deputy chief of Naval Operations (Air) in Washington in August, 1950. A year ago  he reported as executive officer of the Naval Air Station, Kwajalein, Marshall Islands, where he was serving when ordered to the NAS here. Captain Sooy holds the American defense service medal, Asiatic-Pacific Campaign medal, American campaign medal, World War II victory medal and national defense service medal. He is married to the former Josephine Zillah Moore of San Jose, Calif, They have one daughter, Chandra Lou. [b. Feb.6 1933, Los Angeles]. Where does Krystinak say Sooy was ONI? BTW, I don't think James Richards independently said Sooy was ONI -- he asked if anybody knew about Sooy and Greg Parker replied that Sooy was ONI, which evidently was good enough for James. 1 ) It looks like it it's in very good, clean condition, as would be expected if it was owned by a navy captain and former aviator. 2 ) Generally speaking, older people (like Sooy who was 60 years old in 1963) like to keep an older car (like this one) with which they are familiar and comfortable. One last photo of Sooy and Krystinik together - again credit to James Richards who originally posted it in another thread here about Krystinik & Sooy. 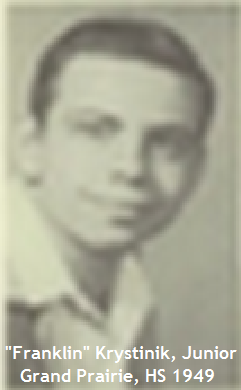 I've also recently done a bunch of genealogical work on him and others and have come up with some great yearbook photos - so I will post those here too, even though this thread is about Sooy. The 2 go together.... like... helicopters and Vietnam! These are all photos of Raymond Franklin "Frank" Krystinik (b. 1932), except for a couple of photos of his younger brother, John "Richard", ( b. 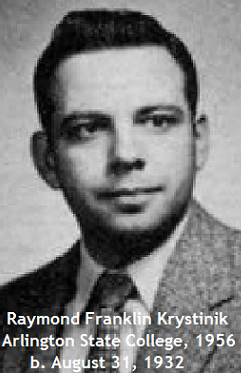 1938) who attended Texas A&M at the same time and is a blonde version of Frank. He also seems to have been studying aeronautical engineering. I'm not sure if he worked at Bell after graduation, with his brother, but I wouldn't doubt it) - those became happy, windfall years for Bell. With JFK out of the way, and his plan for peace - NSAM 263 trashed (with even memories of it buried by Mockingbird journos & "historians") - Bell, Brown & Root, Boeing, and Lockheed-Martin etc...raked in billions in the blood $$$ of Vietnam, and that constant state of warfare persists 52 years later. Bell sold thousands and thousands of Huey helicopters - the iconic symbol of an American quagmire. Thanks for the clarification about who said what. Ok, maybe James didn't "state" Sooy was ONI, but as you said, Greg did, and James agreed with his assessment, which, my feeling is, is tantamount to him "saying" Sooy was ONI, I'm guessing Greg did some digging to find out and I don't doubt him and neither did James. And, i think you misread, I never said that Krystinik said, Sooy was ONI. I said Greg Parker and and James Richards did. Besides do spooks point out other spooks?! I think that's against protocol, isn't it? When i was researching Sooy over a year ago when i first heard of him via James, in a FB JFK group, I remember reading in a book online somewhere that when Sooy was either in Panama or Trinidad (or both) one of his jobs was to select the ONI intelligence operatives for that entire region (can't remember what the region included - if it was the Caribbean or South American and the Caribbean. I swore I bookmarked that but now i can't find it. Probably filed it in the wrong folder.). At any rate, i think to pick ONI spooks one would probably have to be the head ONI spook...no? I also would have a hard time imagining the Navy would set up anyone over a Naval Air Station, let alone 3 of them - one criticically involved in nuclear/ballistic missiles (Trinidad) during the height of the cold war - without them being ONI. It's just not plausible, And Sooy seems to have been not only a friend to Krystinik but an older mentor (he was almost 30 years older) - I'm guessing it had a lot to do with being ONI. Those are great thoughts about the coup, Tommy! I agree - it looks like it was very well cared for. Probably his. Plus the way it was pulled there crooked - sort of like he knew he was a bigwig who could park however he liked and no one would bother him. If it were a common person, the DPD would have had him move his car or at least park it neatly along the sidewalk. BTW, You should search this forum for "Robert D. Steel." I interviewed him a few years ago. He must have known Sooy. At first I was thinking about James Bookhout, the FBI agent....but as you can see the spellings indicate two distinctly different surnames. who was commander of a U.S. base in Panama, as was Sooy. "Sorry, this content isn't available right now."